yadu had five sons called sahasra-da, payoda, kroShTa, nIla and a~njika, who are coequal to the sons of the celestials, of whom, oh, king janamejaya, sahasra-da had three pious sons called hiahaya, haya and venu-haya. Then, haihaya’s son is dharma-netra, whose son is kArta, who begot a son called sAha~nja, the founder of a city named sAha~njani. 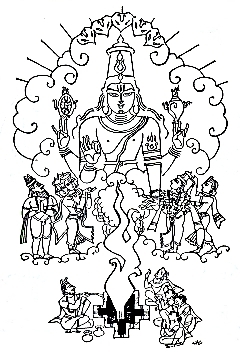 Thousand-arms to kArtavIrya-arjuna signify his ambidextrousness. The reference in the stanza [raghuvamsham of kaalidasa] is to the incident when Kaartaviirya Arjuna while enjoying a bath in the waters of the Narmada with the females of his harem obstructed the flow of the water of the river. Taking advantage of the bed thus left dry down below, Ravana commenced the worship of Shiva Linga there. When Kaartaviirya came out of the river the obstruction was suddenly removed and the flow washed Ravana with the Shiva Linga. Irritated at this Ravana challenged Kaartaviirya to a fight in which he [Ravana] was defeated and taken prisoner. At the intercession of Pulastya Ravana was set at liberty by Kaartaviirya. The Vayu Purana, however, says that Kaartaviirya invaded Lanka and there took Ravana prisoner. – K. M. Joglekar - raghuvamsham of kaalidasa, 6th chapter. After narrating about the dynasty of the first son of yadu, namely sahasra-da, a giver in thousand ways, now the dynasty of second son, namely payoda, is taken up. payaH+da = water, giver; cloud; so also, the word vR^iShaNi is from the word varShaNa= raining; atra payoda eva varShaNAt hetoH vR^iSha shabdena uchyate. Thus, this is the thirty-third chapter of first canto called harivamsha-parva, in harivamsha-purANa, the sequel of mahAbhArata, narrating yadu dynasty and the emergence of kArtavIrya-arjuna.